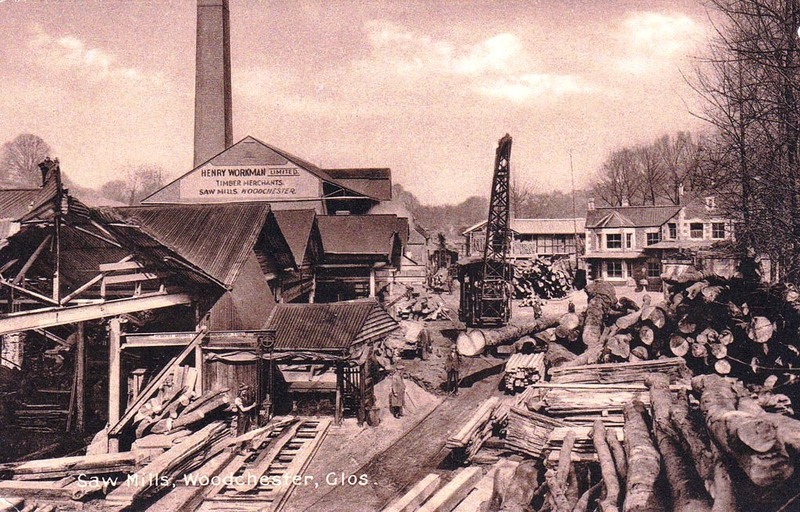 We have a strong connection to the sawmill, as my Grandfather Denis Brown hauled timber for the sawmill from the late 1920s until its closure in the late 50s . 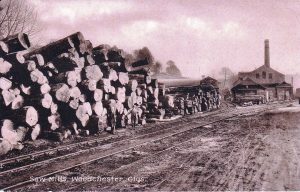 We have the timber yard on the opposite side of the road from where the main building was, our yard was used for the storage of timber . 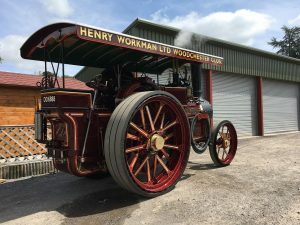 We own and have recently finished restoring the steam traction engine that Workman’s had from new in 1925 to 1941, as well as 2 diesel timber tractors that were owned my Granddad, all of which delivered round timber to the mill. Sawmill staff pose for the camera along with one of the two steam cranes on site. This an early photo that pre-dates the devastating fire of August 1911. 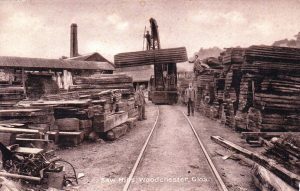 The mill was rebuilt with improvements made, including the installation of a large Paxman-Lentz stationary steam engine, this drove line shafts to various saws in the main building. Burrell works No. 4010, a 5nhp 3-speed double crank road locomotive, was supplied new to Henry Workman sawmill of Woodchester, Gloucestershire in April 1925 and is believed to be the last new traction engine delivered to the county. The Burrell replaced a Garrett 4CD steam tractor; No 32775 that Workman’s had new in 1915. 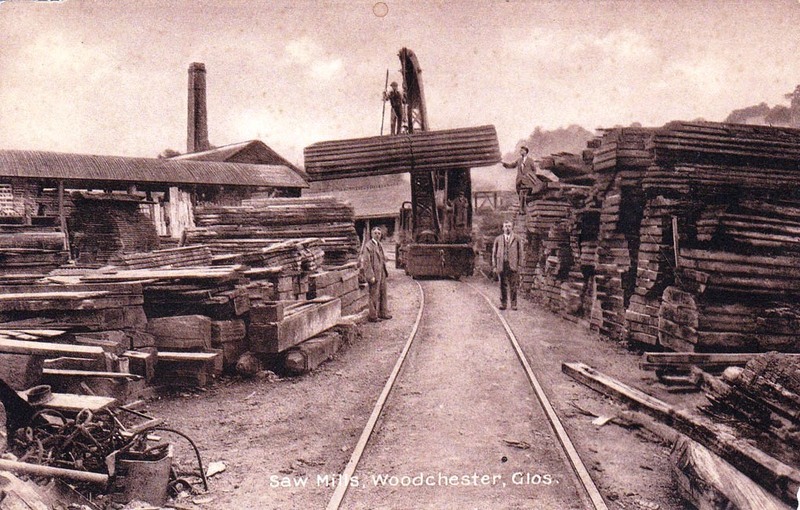 The engine was used by the mill for extracting and hauling round timber back to Woodchester for sawing. 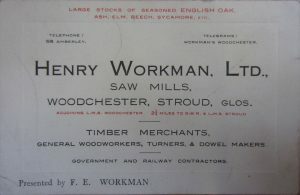 A large amount of this timber was felled on the Ebworth estate near Sheepscombe, as well as the Horsley and Kingscote Woods. 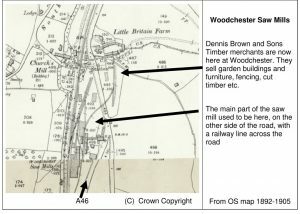 These woodlands, all owned by the sawmill, were renowned for the quality of the Beech they produced, earning them many awards. 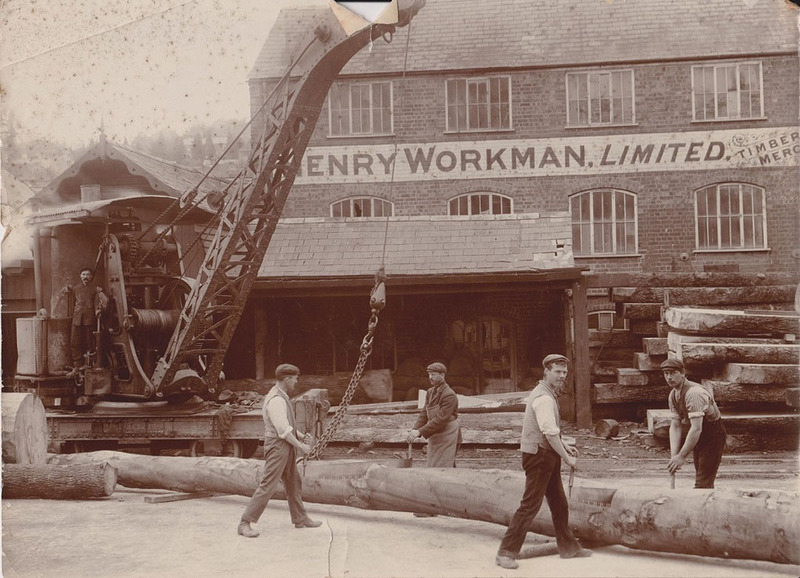 It was during the late 1920s that my grandfather Denis Brown began hauling timber for the Henry Workman sawmill after relocating to Woodchester from Crowborough, Sussex. 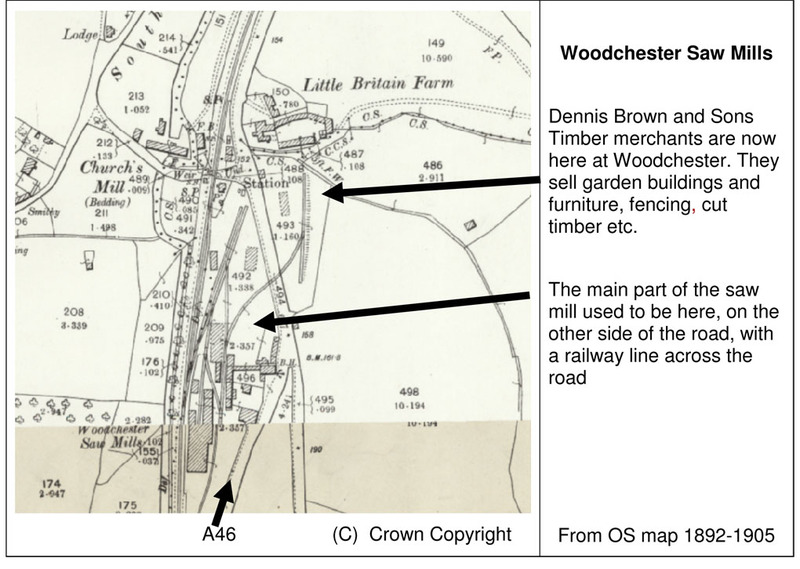 Initially Denis relied on steam tractors for this timber work but as the work load increased in the 1930s, Denis with help from the sawmill invested in a more modern petrol Latil timber tractor along with matching pole trailer. 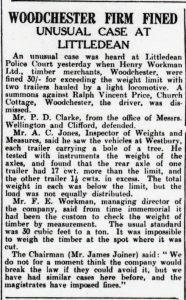 These modern methods of haulage proved more than adequate for the supply of round timber for the sawmill and by January 1941 the out of date Burrell engine was sold on to Jesse Vines, the well know engine dealer from Gloucester. 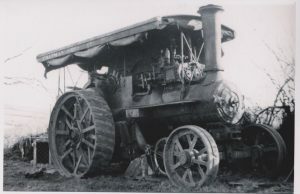 Jesse had the engine for only a short time, and in August 1941 the engine was sold on to agricultural contractor and dealer Murch Bros of Umberleigh, Devon. 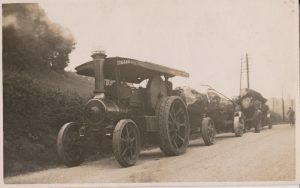 The engine was used by Murch for sawing and threshing. 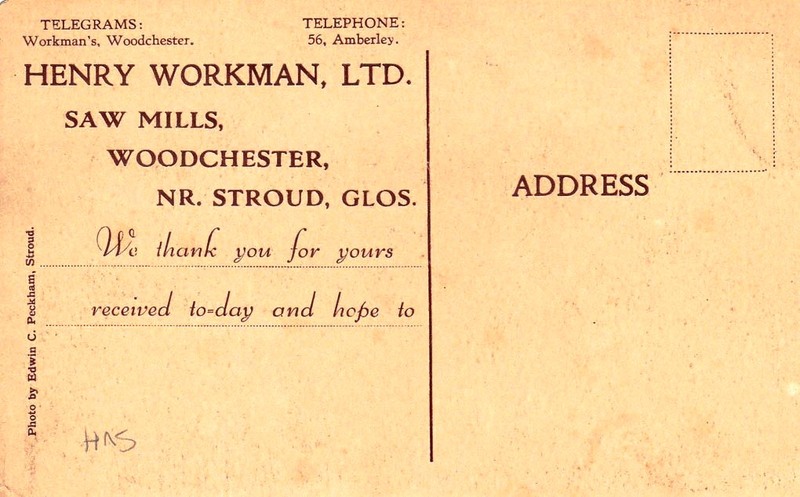 After a short time the engine was sold on again, going to Chapman Bros, an agricultural contractor of St Wenn, nr Bodmin, Cornwall. 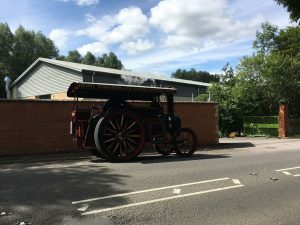 They traded a Marshal traction engine for the Burrell and used it for threshing through the war years and into the late 40s . To carry out this work Chapman’s removed the belly tanks and motion screens, as happened to a number of road locos. 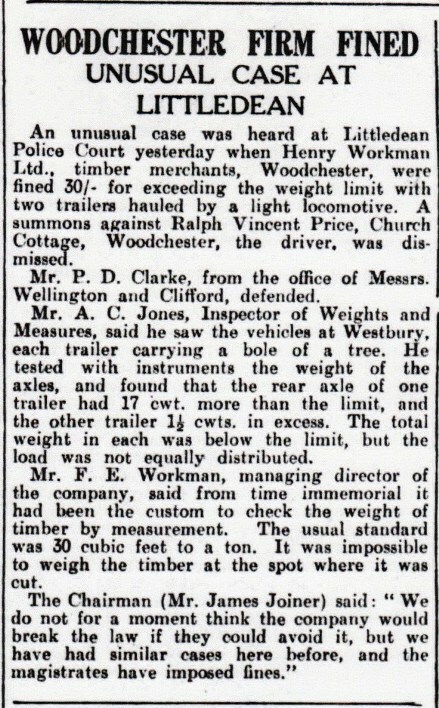 Also by this time the engine was fitted with much smaller diameter Marshall front wheels, the reason for this is unknown, although possibly as the result of an accident. Chapman Bros would be 4010s last commercial operator and the engine was sold into preservation around the early 1950s to Reg Tonkin of St Eval, Cornwall. 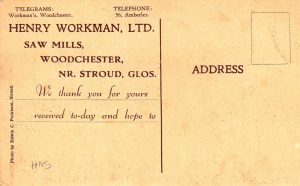 Whilst in his ownership Reg Tonkin gave 4010 the name ”Empress Of Cornwall” and added showman’s fittings after he had acquired them from Burrell 3660 that had been cut up earlier. Reg attended the early West of England steam rallies with the engine from 1956 but later 4010 would spend a number of years laid up in Cornwall needing a new fire box until 1977, when it was sold to Martin Burr from Sheffield. The engine by this time was terribly worn out, not only from the heavy timber work it had carried out commercially but also from the salty Cornish sea air. 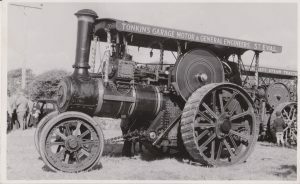 Martin soon began restoration work, fitting a new fire box, barrel, rebuilding the tender and other worn parts, but never completed the engine. 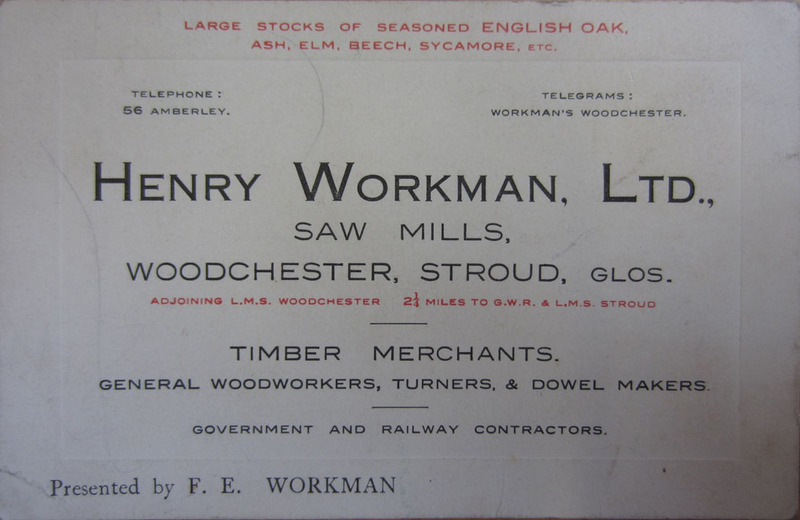 We made contact with Martin around 2008, explaining to him of our connection to the Henry Workman sawmill, and we were able to make a number visits to see 4010. 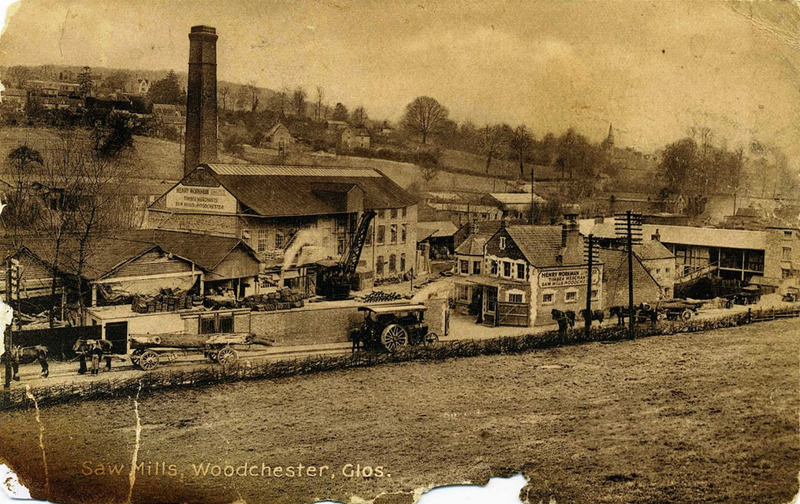 It was during August 2014 we received word from Martin that he was selling 4010, this an opportunity not to be missed and after negotiations we purchased the engine from Martin later that month and it returned to Woodchester after being away since the early 1940s (our premises occupies part of the old Henry Workman sawmill site). We continued the restoration work over the next few years, work completed includes making the correct large diameter 3′ 10” Burrell front Wheels, new front axle, rear axle, restoration of the back wheels, new final drive and spur gears as well as full repaint and lining. 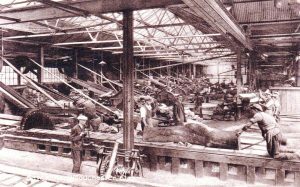 The last major job was making belly tanks. The engine has now been returned to steam and can been seen in public for the first time in many years.